Deb is available to treat both your horses and your companion animals. Please email or call to discuss your requirements. Rocktape Equine is a kinesiology tape that has a unique adhesive perfect for all equestrian sports. It is being used more regularly by innovative equine practitioners, trainers and coaches. First used by acupuncturists and chiropractors in Japan, today kinesiology tape is used by practitioners throughout the world to treat injuries and improve sports performance. Rocktape Equine can be used as either a sole or an adjunctive treatment in equine therapy. It can be used to reduce or control pain, manage swelling or oedema, increase joint range of motion and muscle function, and maintain a level of functionality and comfort for the horse throughout the rehabilitation process. It can also be used to assist the equine to maintain functionality and comfort in training and assist with recovery, thus facilitating overall soundness in the equine athlete. 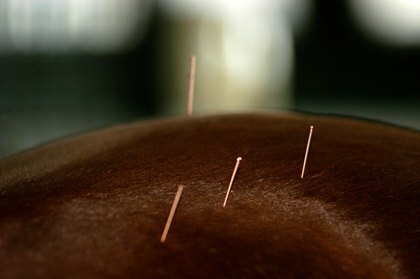 Acupuncture may be defined as the insertion of needles into specific points on the body to produce a healing response. Each acupuncture point has specific actions when stimulated. This technique has been used in veterinary practice in China for thousands of years to treat many ailments. The Chinese also use acupuncture as preventative medicine. Acupuncture is used all around the world, either alongside or in conjunction with Western medicine, to treat a wide variety of conditions in every species of animal. Clinical research has been conducted showing positive results in the treatment of both animals and humans, and the use of acupuncture is increasing. Acupuncture will not cure every condition, but it can work very well when it is indicated. In addition, regular acupuncture treatment can treat minor sports injuries as they occur and help to keep muscles and tendons resistant to injury. World-class professional and amateur athletes often use acupuncture as a routine part of their training. If your animals are involved in any athletic endeavor, such as racing, jumping, or showing, acupuncture can help them keep in top physical condition. Although acupuncture has its roots in ancient times before modern scientific methods were available with which to study it, many important studies have been done to indicate how acupuncture works and what physiologic mechanisms are involved in its actions. Using functional MRI (fMRI), to examine 15 different points, the basic tenets of acupuncture have been proven. Those are that acupuncture is based upon the point selected, the method of stimulation, and the duration of stimulation. Stimulation of these points result in specific changes in the central nervous system. It was shown that acupuncture points that have pain relieving properties associated with them tend to activate specific pain-association brainstem regions. In America, the National Institute of Health developed a consensus statement about acupuncture and its efficacy. NIH said that there was compelling evidence that acupuncture was useful in the management of osteoarthritis and musculoskeletal pain. In western medical terms, acupuncture can assist the body to heal itself by affecting certain physiological changes. For example, acupuncture can stimulate nerves, increase blood circulation, relieve muscle spasm, and cause the release of hormones, such as endorphins (one of the body’s pain control chemicals) and cortisol (a natural steroid). Although many of acupuncture’s physiological effects have been studied, many more are still unknown. Further research must be conducted to discover all of acupuncture’s effects and its proper uses in veterinary medicine. Acupuncture is one of the safest forms of medical treatment for animals when it is administered by a properly trained practitioner. Side effects of acupuncture are rare, but they do exist. An animal’s condition may seem worse for up to 48 hours after a treatment. Other animals become lethargic or sleepy for 24 hours. These effects are an indication that some physiological changes are developing, and they are most often followed by an improvement in the animal’s condition.